Australia is one-of-a-kind country for many reasons. It comprises the entire Australian continent, the island of Tasmania and countless smaller islands. It boasts a wide variety of landscapes, with mountain ranges, tropical rainforests, and a dry desert. It is the flattest continent with the oldest and least fertile soils. Australia is also the smallest and the driest continent on Earth. 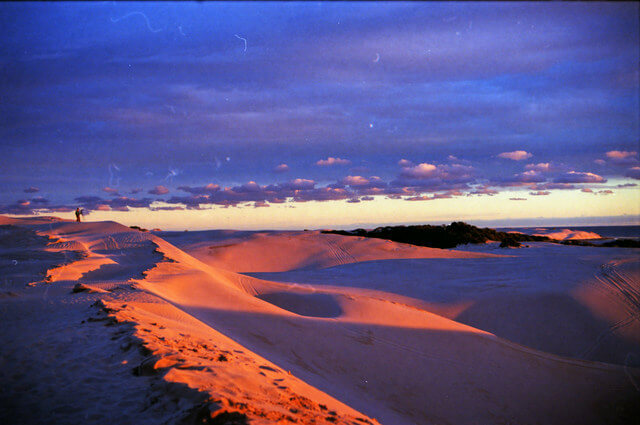 Fantastic desert or semi-arid land commonly known as the Outback covers most of the land. Nevertheless, you’ll fall in love with the golden sand shores and crystal clear water of the Australian seashore. The waters that surround the continent feature almost as much variety in landscapes as the surface: vivid corals, tropical fish, massive rock formations, and historic shipwrecks. Nature here is omnipresent and features a diverse range of unique species as well as the most dangerous ones. Whether you’re looking for a calm spectating experience, heart-pumping adrenaline rush, or maybe something in between – Australia has a lot to offer. The above combination makes the country a real wonder for tourists from all corners of the world looking for an unforgettable adventure. Yet another sand dune—taller, steeper, and seemingly softer than anything we had crossed before—raised its rippled crest in front of us. The heavily loaded SUV, weighed down with three weeks worth of gear and supplies, seemed to groan in resignation of what was in store for it. I slammed the gear lever back to third low and planted the foot; the engine roared in anger and we hurtled our way over the washboard worn track at the red wall of sand. Travel the Canning Stock Route and you’ll have to cross countless such dunes between the tiny townships of Wiluna in the south of Western Australia and Halls Creek in the north. 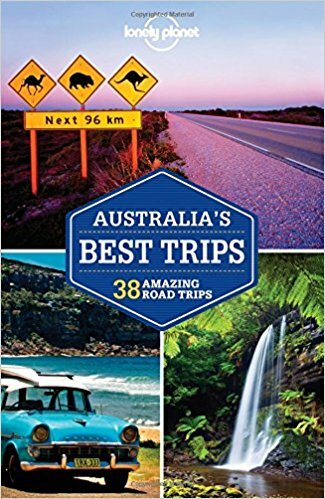 This is a trip you will certainly remember for the challenge of the journey—on this longest and most remote of Australia’s desert tracks, you’ll need to bring 50 gallons of fuel, 20 gallons of water, camping gear, food, and supplies, not to mention spare parts for the vehicle. But you’ll also remember the delightfully varying desert landscapes, the palpable sense of history, and the peacefulness and tranquility of a remote, untouched country. I hung motionless in the water, sucking air through the gurgling snorkel and straining to see into the blue void. I could feel the warmth of the sun on my back, the caress of the ripples on my bare skin. Around me a few other like-minded adventurers—Viv and my son Trent included—hung in a similar trance. Waiting. Then things changed. Out of the gloom of 30-foot visibility a giant form materialized, silently and seemingly without effort. A second later it was below me and only then did I realize how quickly it was moving. I snatched a quick breath, then flicked over in a duck dive but already its giant dorsal was under me, just an arm length away. And then I saw its tail, flowing, curving in a sweeping arc towards me and I realized I was already down the back end of this fast moving giant. I hit the surface and powered into my fastest free style, fins helping to power me along—and the giant tail, swinging back through a lazy arc, was the last I saw of this mammoth of the sea as he raced away languidly into the gloom. 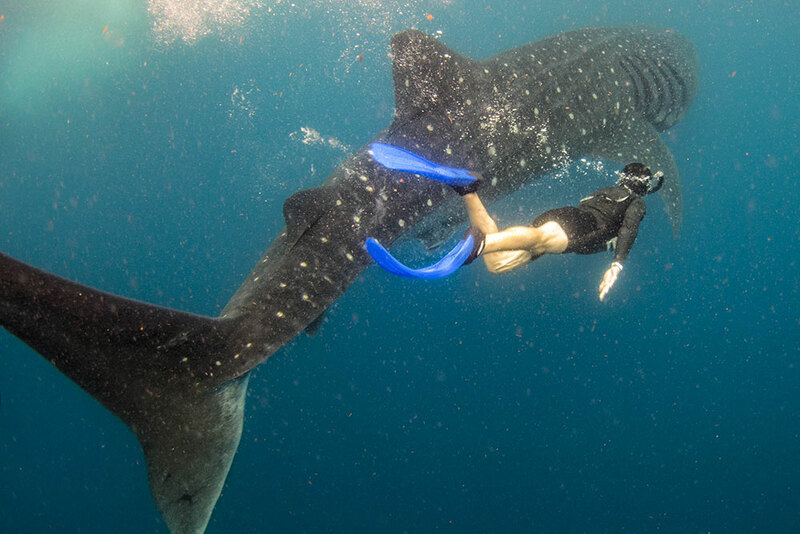 Ten more times that morning we did the same thing—that’s what you do with whale sharks. What a mind-blowing experience! 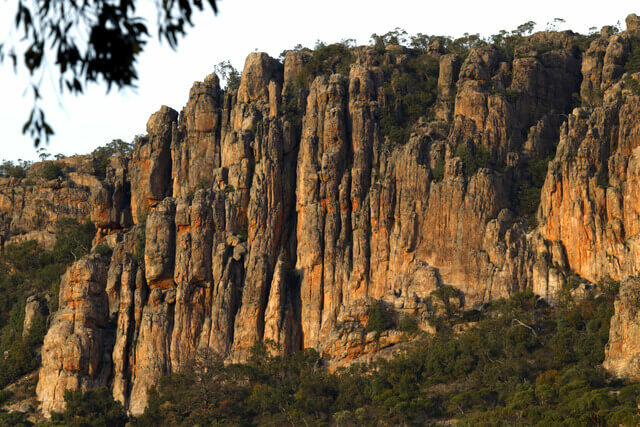 Mount Arapiles, Australia’s premier rock-climbing spot, towers over western Victoria’s rural flats like a medieval bastion. Its huge sandstone battlements and craggy peaks are visible for miles around; from a distance the orange, yellow, and gray rock looks rather crumbly, but in fact this is one of the finest climbing areas in the world. About a ten-minute drive from the town of Natimuk, Arapiles and its small conservation park are easily accessible from Melbourne or Adelaide. On its crevasse faces, sheer cliffs, and swooping overhangs, over 2,000 routes have been scaled. There are easy clambers—like the long and exposed Tip Toe Ridge (grade 4, on the Australian system). There are lots of extreme challenges, from the glorious five pitches of the grade 12 Bard to Thundercrack, a steep, exposed, 100-foot grade 20. And then there are the legendary routes like the grade 21 Kachoong, one of the most airy overhangs on the mount. Still more routes grade up above 30—stuff only a world-class rock jock can even think about ascending. 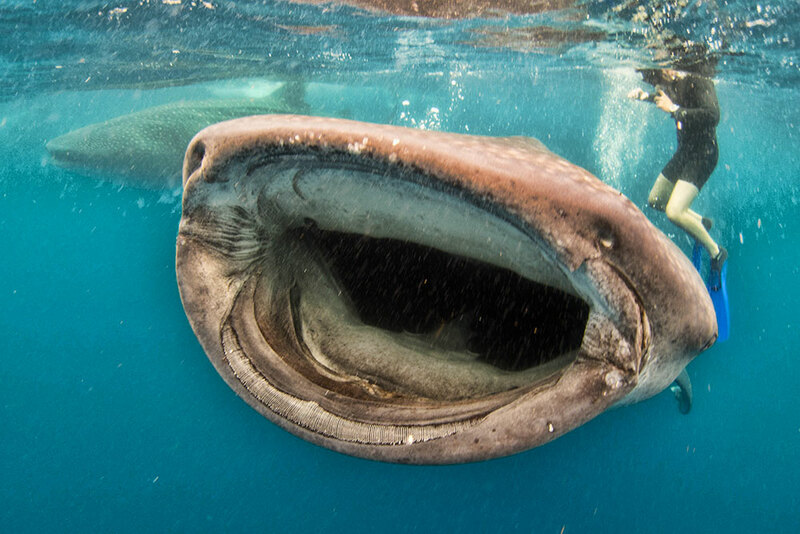 They come up to greet you like long lost pals—more than 20 species of giant fish, some surpassing the 200-pound mark. But while the big cod of the Great Barrier Reef’s Cod Hole crowd around like friends at a party, their motives aren’t entirely honorable. After years of being fed by divers, the big fish of the Cod Hole have learned that the presence of a snorkeler or diver means chow time. 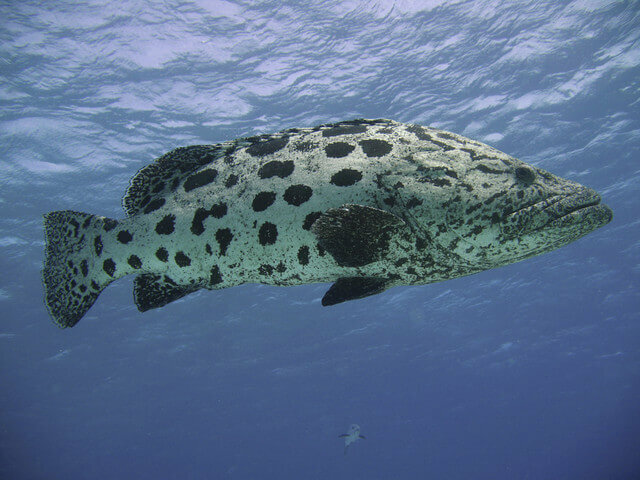 Most of the freeloaders are big estuary cod, but a host of other fish fill the minor billings. There are smaller, more brightly colored cod of half a dozen different species, as well as sweetlip, grouper, angel fish, coral trout, a couple of friendly moray eels, and a very large Maori wrasse that comes in the from the deeper water once the feeding frenzy has reached a peak. And frenzy is truly the word for it. Fish thunder in from all sides to surround the “lucky” divers carrying the feed buckets; those without food are also accosted and closely inspected for any morsel or tidbit. The whole affair makes a football scrum look like a child’s party—it goes without saying that if you are not confident underwater, don’t carry the food! The action is typically brief and intense; once the food has been gorged and fought over, some semblance of normality returns to this enclave in the reef. The giant cod settle back into cruise control as they swing along the walls of the reef and across the sand bowl; the morays return like dogs to their kennels; the coral trout hang motionless over the coral bommies, patiently waiting for any small fish to swim too close; the giant Maori wrasse glides off silently form whence he came. 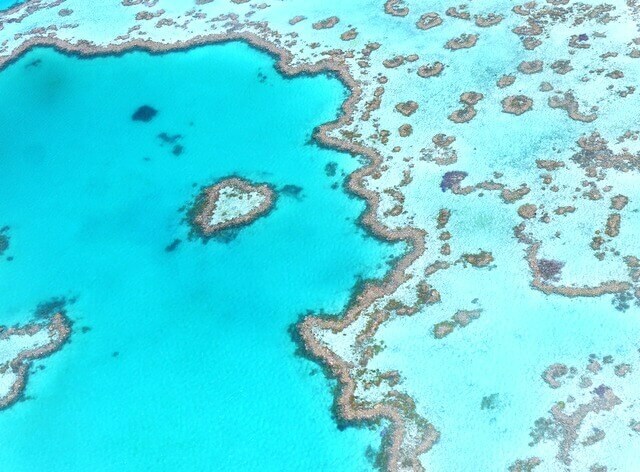 The Cod Hole is situated on the southern side of Cormorant Pass, itself about 15 miles from the plush resort of Lizard Island; you can also get there via a longish boat ride from Cairns, the tourist capital of North Queensland. The gas burner lights with the roar of an in-bound express train, and in the chill of the early winter morning the heat can be felt from 30 feet away. Billowing and bucking, the great colored cloth envelope begins to take shape until it towers tall and proud above the ground and the small group of people at its base. At the command of our pilot we clamber into the balloon’s wicker basket, trading smiles with the other eight adventurers who join us in its confines. The roar of the burners continues and then we lift off, climbing quickly into the blue sky. When the burners are switched off, a silence settles on our airship; we drift effortlessly above a patchwork of farmland, vineyards, and natural forest, all of it scored by winding waterways and straighter tracks and roads. Farm animals graze on the rich green pastures, while a group of grey kangaroos feed and groom in a early patch of sunlight close to the forest’s edge. 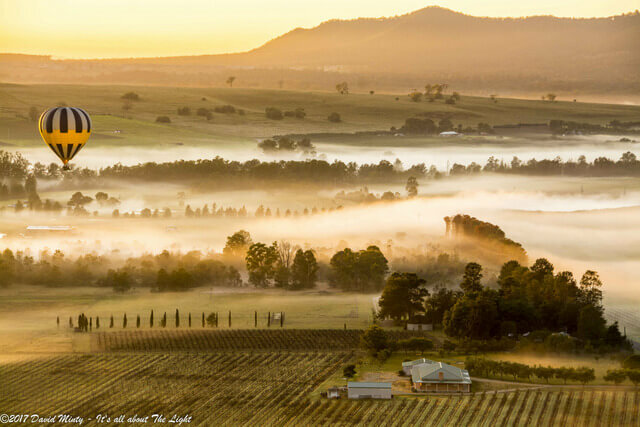 Peace and serenity—the magic of a balloon flight over New South Wales’s Hunter Valley! 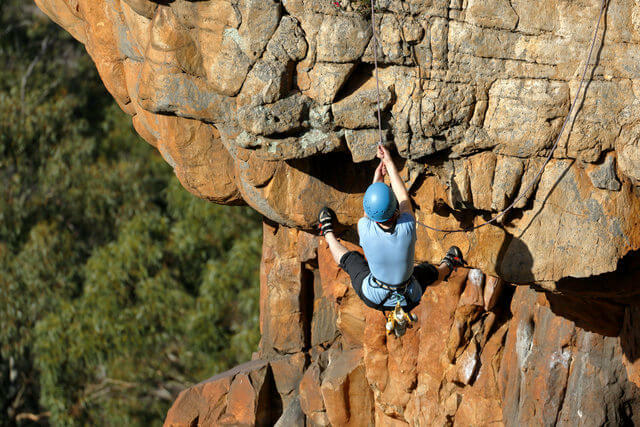 Mix a warm summer’s day, a wet suit, rope and rappelling gear, a good dose of adventure, and a drive just a couple hours inland from Sydney, and you’ll have put yourself right into a canyoneering adventure in the heart of the Blue Mountains. 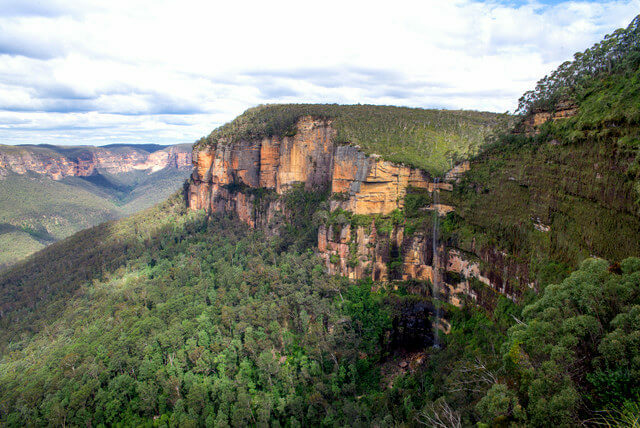 Here, spawned on the great sandstone plateau that makes up the crest of the Blue Mountains, dozens of different streams have cut their way down through the rock to form an untold number of gorges, canyons, grottoes, and waterfalls. The theory is simple enough: abseil (rappel) down the waterfalls; swim or float along the quiet, still sections of the waterway till the next waterfall; repeat as necessary until you come out at the bottom of the mountain range. Some of the canyons are an easy adventure, while others can be much more demanding, mazes requiring not only technical skills and lots of experience but excellent route-finding abilities. The allure of these trips can be felt by anyone with an adventurous heart—you’ll visit dark, wet, mysterious grottoes and chasms, feel a coolness almost unthinkable up in the”real” world of summertime Sydney, and burn with the adrenaline of sheer drops and flooding, pummeling water. We lay anchor in quiet waters close by the towering cliffs, while just 60 feet away giant swells rolled up and crashed against the basalt battlements. I slipped the regulator into my mouth, did a last quick check of vest, air gauge, and mask, then clutched my underwater camera tightly to my chest and rolled over the side. When the veil of bubbles dissipated I was floating in clear water close to the shore; before me lay a patchwork quilt of sedentary marine life—gorgonian corals, sea pens, zooanthids, and a host of other creatures, all together covering each and every nook and cranny of the underwater landscape. Fish of every shape and size orbited around me. It was easy to see why this underwater Eden, just a few hours drive south of Sydney, is such a popular dive site. The big headlands that extend like great pincer-like arms to form Jervis Bay are a major reason behind the excellence of the diving here. The whole of the east coast of Australia is swept by a tropical current arising from the Coral Sea; these headlands jut out into this great stream of warm water and capture some of it. 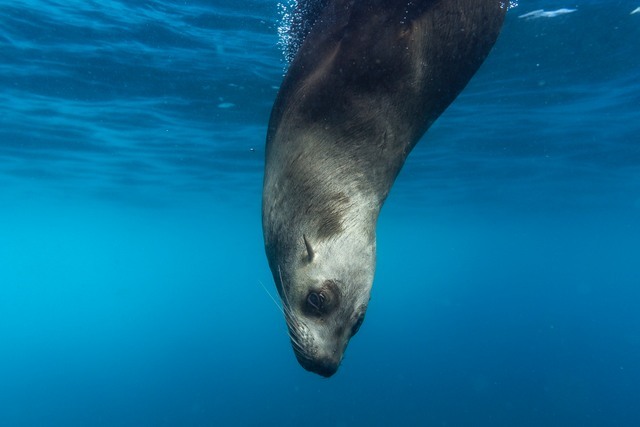 The warm water, accompanying tropical marine life, and clear, calm conditions make for the best diving anywhere along the southern coast. Just a few minutes away from the vibrant hum of Falls Creek, one of Australia’s top ski resorts, a gentle slope leads past the last ski shelters and toward the low wall of the Rocky Valley Dam. In the depths of winter, this small man-made lake, surrounded by the low rolling hills of Bogong High Plains, is the start of a number of ski trails varying from an easy day run to longer, more difficult overnight tours. One ski trail that’s a good introduction to the area starts just across the dam wall with the pole line that you follow skirting along the northern edge of the lake. 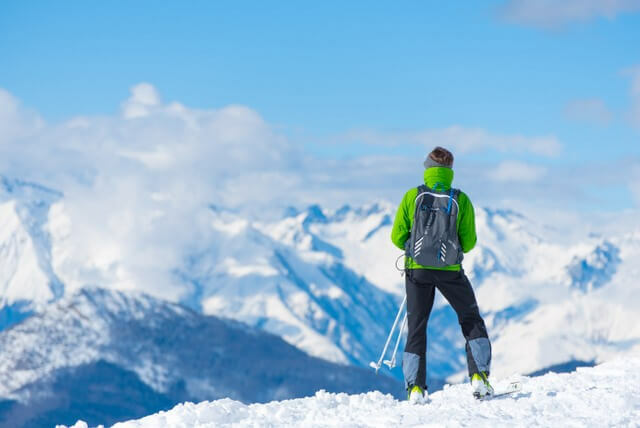 As you dip into the low valley of Watchbed Creek you pass the junction of the ski trail to Ropers Hut and Mt Bogong, the highest mountain in Victoria and a trail that is only for the more experienced and well-equipped overnight skiers. A little further south near Langford Gap there is a choice of routes along the gentle gradient of the Langford Aqueduct; the southern route is a delight, passing through patches of gnarled snow gums bent and twisted by the harsh winters but still standing proud above the thick mantle of snow. This route takes you close to the historic Wallaces Hut and then Cope Hut, both of which make for a good shelter if the weather turns bad, as it often does in these exposed peaks of the Victorian Alps. But on a fine day with blue skies, a couple of friends, and thick powder snow, this Australian winter wilderness is the equal of any backcountry skiing elsewhere around the globe. In the blink of an eye our destiny was on us—a suddenly voracious current ripped us out of riverine peace and quiet and into the thunderous Great Ravine. The first assault was upon our ears: the roar of churning whitewater reverberated off the cliffs above us and drummed our senses. Then the drop itself loomed terrifyingly, until the nose of the raft bent and we were swept over the wall into a cauldron of whitewater. This was “The Churn,” the first monster rapid rafters encounter when they enter the Great Ravine, the most spectacular chasm on the wild, untamed Franklin River. It’s a stair-step river—over a pounding wall of whitewater, then a tranquil stretches of flatwater, then another boiling mass of foam and thunder; you bounce along from Inception Reach to Serenity Reach, the Coruscades, Transcedence Reach, Thunderush, and finally, after The Cauldron, you float into Deliverance Reach. From here the Franklin takes on a more gentle nature; there are still some gorges and rapids to pass through, but you can take them on knowing that you’ve topped the ultimate challenge. 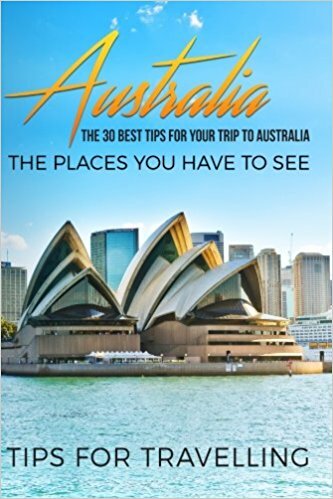 When it comes to things to do in Australia there are many beautiful places – this is an Australia bucketlist. Click through! Did You Know Australia Has Pink Lakes?? You Have To See These! 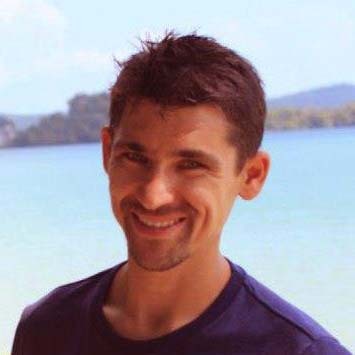 Nick Howdy is the traveler and survivalist behind BestOutdoorItems.com; a site where he shares his opinion on different products for outdoor activities. Australia is a country and continent surrounded by the Indian and Pacific oceans. There is lots of thing to, If you love the nature then Australia is the perfect place to visit. 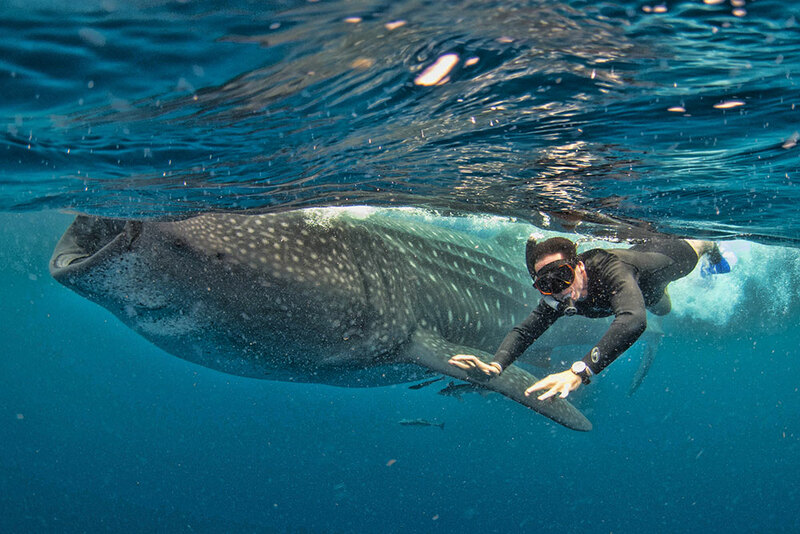 Swimming with whale sharks looks so incredible! SUCH an incredible adventure, it’s on the top of my list too! Australia is at the TOP of my bucketlist I’ve been dying to travel for so long. I fear we probably won’t even be able to scratch the surface of your list here, but appreciate the ideas! Hopefully will be able to get at least one or two in depending on where we ended up going. I heard you can go diving with crocodiles in Darwin – true? You can indeed – it’s cage diving, so you’re not actually swimming with them per say, but sharing the same water, so it’s pretty crazy! The experience is called the Cage of Death and the place is called Crocosaurus Cove. Australia is such a vast continent. You could visit 100 times and still have a list the length of my arm (I have long arms!!). These are great ideas, and beautifully written, loved the descriptions. We have been to the Blue Mountains but not canyoneering, actually we’ve visited many of the places mentioned, though not tried the respective activities. Will have to visit again at some stage. A wonderfully written article. Thankyou. Yes you could! So glad you enjoyed the post Rika, Nick definitely did a great job of bringing each experience to life! 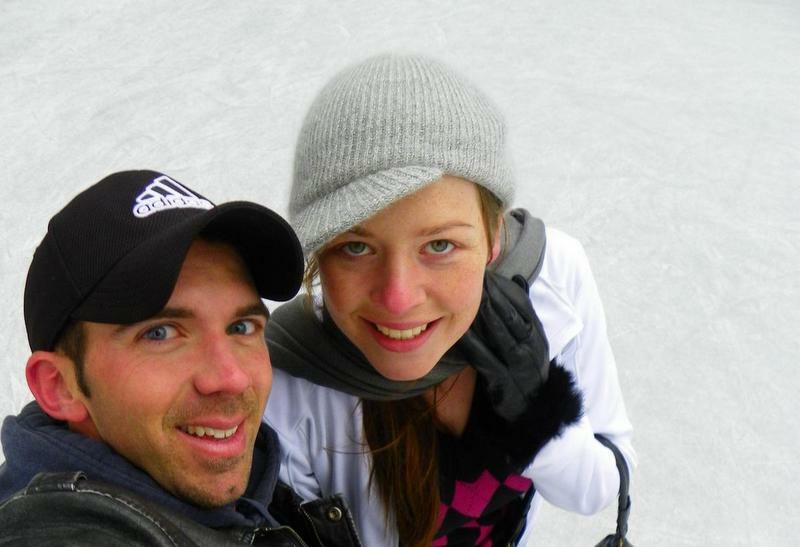 I had no idea there was snow in Australia, or that skiing was a thing. I wonder why you never see that. There is indeed! Perisher Blue in Jindabyne is the country’s biggest alpine resort :) I don’t believe it snows in central Autralia / the Outback, but on the south east coast up in the mountains it definitely snows! Our family is trying to plan a trip to Australia right now and it’s tough! We only have two weeks. Any suggestions for trips from Sydney? And adventures that are safe for young teenage kids? Hi Marty, I feel your pain, there’s a lot to see and do! The beaches throughout (and south of) Sydney are fabulous, and if you want to do actual trips out of the city you can rent a car and explore some of the south coast – lots of wildlife like kangaroos and marine mammals like seals which the kids would likely love. The Blue Mountains is anther region that’s a great trip from Syndey, with lots of outdoor recreation and a lot of family friendly things to do. 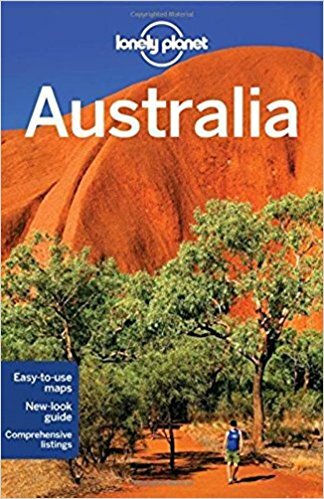 Great guide to plan my stay in Australia. Thank you!